The Grand Lodge of Ireland is the second oldest in the world and the first evidence for its existence comes from the Dublin Weekly Journal of June 26th 1725. The paper describes an event, which took place two days previously on June 24th – a meeting of the Grand Lodge of Ireland to install the new Grand Master, the 1st Earl of Rosse. Unfortunately the exact date of the foundation of the Grand Lodge is not known, but the installation of a new Grand Master would suggest it was already in existence a couple of years. 1725 is the year celebrated in Grand Lodge anniversaries. There is considerable evidence that there were Masonic Lodges meeting in Ireland prior to the eighteenth century, for example the manuscript known as ‘the Trinity Tripos’ dating to the 1680s, and the Baals Bridge Square, discovered in Limerick in the mid nineteenth century, which dates to the early sixteenth century. There are a number of Masonic lodges in Ireland that lay claim to have met prior to the formation to the Grand Lodge of Ireland. These are known as ‘Time Immemorial’ lodges. Freemasonry is one of the world’s oldest fraternal societies and has flourished in Ireland for more than 300 years, bringing together men of goodwill and integrity, tolerant of the beliefs of others, charitable in disposition and striving to achieve high moral standards in every aspect of their daily lives. Towards the end of the eighteenth century the number of new Lodges being founded increased dramatically at the same time as the popularity of the Volunteer Movement expanded. Several Lodges were associated with Volunteer Regiments; in Dublin, the Officers of the Independent Dublin Volunteers founded the First Volunteer Lodge of Ireland No. 620 in 1783. The Ballymascanlon Rangers were associated with Lodge No. 222, Dundalk, and in Fermanagh there was a regiment known as the Lowtherstown Masonic Volunteers. The political influence of the Volunteers combined with the success of the American War of Independence and the French Revolution created new ideals of democracy in Ireland. Following the founding of the Society of United Irishmen several Lodges, particularly in the north of Ireland, made public proclamations in the press about the need for reform of the Constitution. Whilst the vast majority of Lodges that did this disavowed violence as the means to an end, some were quite rebellious in their proclamations. Other Lodges, it must be said, publicly dissociated themselves from their more revolutionary Brethren. Government pressure was brought to bear on Grand Lodge and notices were sent out reminding Lodges of the Grand Lodge Law forbidding quarrels of a religious or political nature to be brought within the doors of the Lodge. However, several well-known United Irishmen including Henry Joy McCracken, Henry Monroe, and Archibald Hamilton Rowan were also Freemasons. The Grand Lodge of Ireland, independent and autonomous, is the governing body of Irish Freemasonry, which consists of hundreds of Lodges located throughout Ireland and in many places around the world where Irish Freemasonry is held in high esteem. The published Laws and Constitutions of The Grand Lodge of Ireland strictly regulate Freemasons and Lodges, and the dates, times and places of meetings are published in the Annual Calendar. Most Lodges meet once a month for nine months each year. 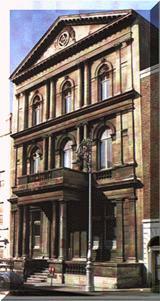 Freemasons’ Hall, Molesworth Street, Dublin, is the headquarters of Irish Freemasonry. This fine building, erected in 1865, includes a Museum, which displays documents, artefacts and regalia providing an insight into Irish Freemasonry. Conducted tours of Freemasons’ Hall and Museum are given each year during the summer months, when the Hall is open to the public. The Grand Lodge of Freemasons of Ireland is the governing body, within the island of Ireland and it, like the Grand Lodges of England and Scotland, administers Lodges under its jurisdiction across the globe. There are many other Regular Grand Lodges around the world practising in a similar manner and these enjoy a happy and fraternal relationship with the Grand Lodge of Ireland. There are, however, a few self-styled Grand Lodges and other organisations that use the word Masonic, but which do not require the same high standards from their members, and which may become actively embroiled in political or religious matters. Contact with these irregular organisations is very strictly forbidden. To obtain further information about the Grand Lodge of Ireland please click here.